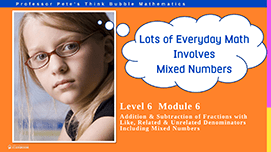 Activities to add and subtract common fractions, using a variety of thinking approaches and written algorithms. 3pp. Features and functions of the Fractions Addition & Subtraction Gadget: Linked to pictures of shapes. Walks through each step of the process. Adding fractions with like denominators. Includes horizontal and vertical layouts, and with number lines. Adding mixed numbers with like denominators. Includes horizontal and vertical layouts, and with number lines. Adding fractions with related denominators. Includes horizontal and vertical layouts, and with number lines. Adding fractions with unrelated denominators. Includes horizontal and vertical layouts, and with number lines. Subtracting fractions with like denominators. Includes horizontal and vertical layouts, and with number lines. Subtracting mixed numbers with like denominators. Includes horizontal and vertical layouts, and with number lines. Subtracting fractions with unrelated denominators. Includes horizontal and vertical layouts. 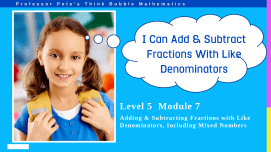 Subtracting mixed numbers with unrelated denominators. Includes horizongtal and vertical layouts. Poster to show with diagrams both horizontal and vertical addition of mixed numbers with like denominators and no regrouping. Poster to show with diagrams both horizontal and vertical addition of mixed numbers with like denominators with regrouping.